A sly, funny, unique gem of a film about the psychogeography of London. 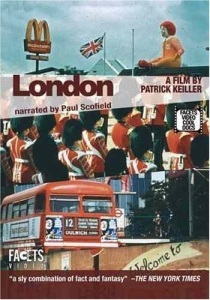 Shot in long, static takes by Patrick Keiller, "an architect diverted into making films", under the guise of a fictional flâneur known as Robinson, the film is narrated by the genteel tones of Paul Scofield, who plays Robinson's anonymous companion. London captures the city moving about its business, but with emphasis upon the quiet, historical undercurrents of a city in the dying grips of Thatcherism. It traces the modest flats of famous poets, views that inspired great painters, the fallout from the 1992 general election and the aftermath of an IRA bombing. Iain Sinclair refers to the London captured in the film as a “necropolis” and suggests that it’s a cinema that “requires no audience”. Considering that Sinclair’s book Downriver was written and published during the initial filming of London, I wondered what links and what differences you see between your and Iain’s work as a whole? I didn’t meet Iain until after London was released, when I had read only one of his books. One of the many differences is that he’s much more prolific. I’m not sure he’s very keen on architects, whereas I’m more ambivalent – many of my oldest friends are architects. Do you see the films as trying to teach people how to look? Not in that way, no. The thing I tend not to talk about very much is the way that the pictures work, in that there’s always an attempt at some sort of hyperreality. There’s nothing nicer than saturated colours and high contrast. And I pursue that. But I don’t think I’ve ever written much about it, or said much about it. I hadn't heard of this, but it sounds quite interesting. Will be looking it up. Thanks!